Select Extensions --> Template Manager from the drop-down menu in the back-end of your Joomla! installation. 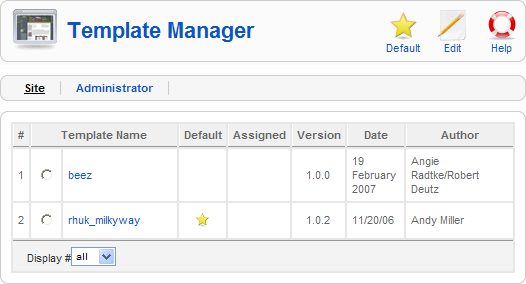 The Template Manager is where you assign a default Template to your Joomla! web site. You can also edit and preview Templates here. In Joomla!, the visual layout of both the Front-end and Back-end of your site is controlled by the Template. Templates are extensions that contain layout and style information that tells Joomla! exactly how to draw each page of your site. 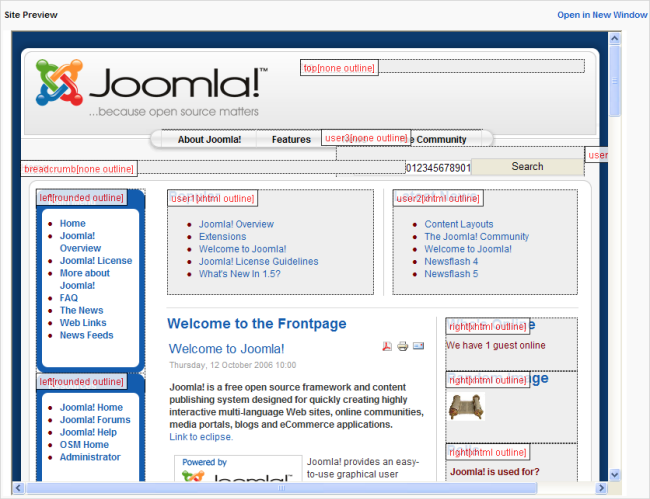 When you first install Joomla!, one Back-end Template and two Front-end templates are included. Other Templates can be installed from third-party developers as Extensions. If you want to use the same Template for all of the pages on your site, you just assign one Template as the Default Template. You can also assign different Templates to different pages. Template Name. The name given to each Template by the Template author. Click the Name to open the Template for editing. If you hover the mouse over the Template Name, a small preview for the Template displays in a pop-up window. The Template Name normally corresponds to the sub-directory name that contains the Template in the <path-to-Joomla!>/templates/ directory. For example, the files for the "rhuk_milkyway" Template are in the directory "<path-to-Joomla!>/templates/rhuk_milkyway". Default. Indicator of Default Template. Assigned. Shows whether this Template has been assigned to any specific menu items. To assign a template to menu items, open the Template for editing. Version. The version number of the Extension. Date. The date this extension was released. Author. The author of this extension. Display #. The number of items to display on one page. If there are more items than this number, you can use the page navigation buttons (Start, Prev, Next, End, and page numbers) to navigate between pages. Note that if you have a large number of items, it may be helpful to use the Filter options, located above the column headings, to limit which items display. Default. Select the Template that you want to be the default Template. Then click this button. The default star symbol will show in the Default column, indicating that this is now the default Template. Edit. Select one item and click on this button to open it in edit mode. If you have more than one item selected, the first item will be opened. You can also open an item for editing by clicking on its Title or Name. See the section below called Template - Edit for information on the edit screen. Site. Shows the Templates available for the Front-end of the web site. Administrator. Shows the Templates available for the Back-end of the web site. These Templates will control the appearance of the administrator portion of the site. Navigate to the Template Manager. Then click on the Template's name or select a Template and click the Edit icon on the toolbar. This is where you can preview a Template, edit a Template's HTML and CSS files, and set parameters for a Template. Name. The Template Name. No entry is allowed. Description. A description of the Template. No entry is allowed. Menus. If the Template is not the default Template, you can assign it to specific Menu Items. To select multiple Menu Items,hold down the Ctrl key while clicking with the mouse. Some Templates have parameters that allow you to change the way the web site will look. For example, the default rhuk_milkyway template allows you to choose a foreground color, a background color, and different Template widths. Other Templates may have different or no parameters. Note: The preview of an administrator template does not show you the administrator module positions. Edit HTML. Opens the "index2.php" file from the Template for editing using a simple text editor. Press Save or Apply to save any changes you make. Press Cancel to cancel any changes. You can also edit this file outside of Joomla! with any HTML editor. Note that the full name of this file is displayed above the edit window. Edit CSS. Opens a list of the CSS files used in this Template. To open one of the CSS files for editing, select the file and press the Edit icon in the toolbar. This will open this CSS file for editing using a simple text editor. Press Save or Apply to save any changes you make. Press Cancel to cancel any changes. You can also edit this file outside of Joomla! with any editor. Note that the full name of this file is displayed above the edit window. Important: Do not delete the default template files using FTP because it generates an error in both the front-end and back-end! Before editing the HTML and the CSS file of the template, it is a good idea to make a backup of the file you are editing. Also, you can edit these files outside of Joomla! using the HTML or CSS editor of your choice. The Preview will only display positions that contain published modules. To make sure you can see all positions defined in the template, you can create custom modules for them. You cannot assign the default template to specific Menu Items. This is because it is already assigned to all Menu Items by default.